As we have already informed you through news release, ACD coin will be changed into BCH platform. This change will enable customers to make use of Bitcoin.com wallet and advance its step for settling the payment at real shops. As for the shops where customers can use Bitcoin.com wallet, we will inform you occasionally at specially arranged website. Please kindly continue to check the website. ・ACD coin: collective name including all 3 kinds of coins described below. ① Old ACD: ACD tokens sold through presale. ② New ACD：ACD tokens exchanged at the first swap. ③ ACD(BCH): ACD token for BCH platform which will be exchanged by the captioned swap. 1. Those who hold New ACD within Coinsuper. It will be automatically exchanged within Coinsuper. Starting from 12 pm on March 12, withdrawal and deposit of ACD coin cannot be executed within Coinsuper. In addition, New ACD cannot be transferred after completing swap within Coinsuper. ※If you transfer your New ACD coins to Coinsuper after completing swap, such transfer shall not be reflected on Wallet and we cannot deal with returning such coins. Please bear this issue in mind. Please refer to the Coinsuper website in addition with regard to the detailed schedule. 2. Those who hold new ACD in MyEtherWallet. Please arrange Wallet for BCH platform. We will transfer ACD(BCH) to the Wallet. With regard to how to set up Wallet, please refer to the manual below. Once you complete setting up the Wallet, please input your information by using the form below. Please transfer New ACD which you hold to the following address. 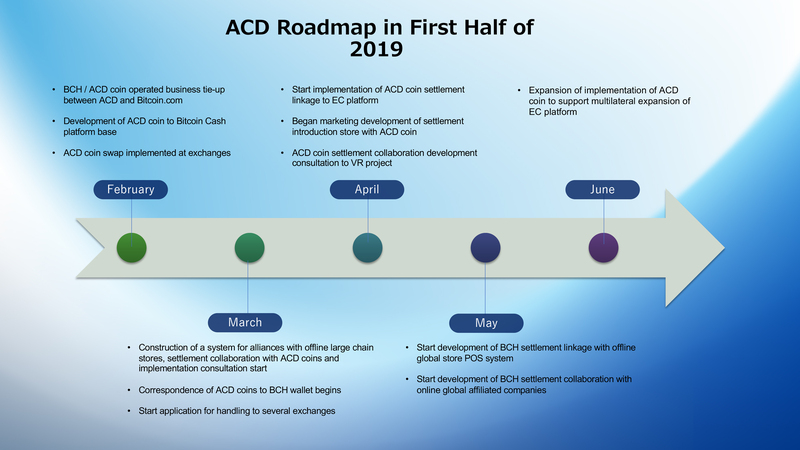 Once we confirm the return of New ACD, we will distribute ACD(BCH). For those who still hold Old ACD, it is required to take another procedure. Therefore, please contact us through the following email. We have to implement the swap again and it will cause inconvenience to coin holders. However, we believe that this is necessary update to improve our ACD coin for the future. Your kind understanding and support on this matter will be highly appreciated. We hereby officially inform that the drawings of TOB commenced since February 7 have been finalized. As we have sent the emails to those who were selected by drawings, those who did not receive the email from us as of today were unfortunately not selected by drawings. Your kind understanding on this matter would be highly appreciated. We hereby inform you that we have sounding on the additional TOB by ACG Corp. Taking the business synergy between ACG Corp. and us into consideration, we are considering to accept such additional TOB proactively. In case if the additional TOB is carried out, we will inform you the details on conditions of TOB on this web site. Therefore, we would like to ask you to continue to look at this web page. The applications of TOB expired last Sunday. You will only receive an email if you have been successfully chosen for application of TOB with the following procedure.